The M710 Ecopia™ is an ultra-fuel-efficient drive radial designed for tandem-axle applications in long-haul and regional service. 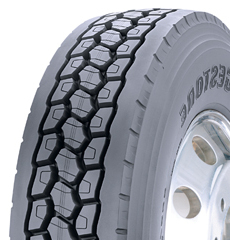 A breakthrough in low rolling resistance through proprietary compounds and design, the M710 is engineered to go easier on your pocketbook, and our planet. Utilizing proven irregular wear-fighting technologies, the result is exceptional fuel economy and removal mileage.